As the United Kingdom winds its way closer and closer to March 29th, the date on which it plans – and is legally required – to leave the European Union, there is a significant amount of uncertainty on what it might mean for the Gallagher Rugby Premiership. There will be economic implications, with Mark Carney, Governor of the Bank of England, warning that a ‘no deal’ scenario will see the value of the pound fall, interest rates rise and risk of another recession. Even the more optimistic projections of what the outcome could be if the Withdrawal Agreement is agreed to by UK MPs on December 11th, still predict a 1-2% fall in the UK’s GDP. The financial implications will play a part in rugby. If the pound weakens, English clubs will face increased challenges in retaining and recruiting players in comparison to the sides that operate in countries using the euro or yen. With club rugby largely unsustainable at the current salary cap mark, there is little desire to increase it in order for English clubs to continue to compete with the spending power abroad. As stands, there is nothing definitive, though, on how the economy will be affected, with the prospects of both deal and no deal scenarios still on the table. One area in which Premiership clubs will be significantly affected is in the eligibility of their players. If a ‘no deal’ scenario comes into place on March 29th, it ends Britain’s association with the EU completely, which will significantly redefine what constitutes a ‘foreign player’ in the Premiership. Currently, any player who has an EU passport or a passport from an associate nation, such as Fiji, Samoa, Tonga or South Africa, via the Cotonou Agreement, is not classed as a foreign player in English rugby. They have the same rights and ability to work in the country as an English player and are not allowed to be subjected to quotas. They are regularly referred to as ‘Kolpak players’, a term which was born out of Maroš Kolpak’s successful legal challenge to have the rights of an EU worker, as a citizen of a country which had an Association Agreement with the EU. This, for the most part, leaves those defined as foreign players in the competition as Australians or New Zealanders who do not qualify to represent an EU nation, with that qualification, if it exists, erasing their status as a foreign player. There are some outliers, such as James Horwill, a fully-capped Wallaby and not an EU nation-qualified player, but who possesses a British passport. Non-EU and non-Kolpak players who are married to an EU national are also exempt from the foreign player status. Still with us? Well done. Whilst English rugby cannot implement quotas on Kolpak players or EU workers due to EU law, it has managed to strike a healthy balance in ensuring that English-qualified players (EQP) are well-represented, by establishing a quota on EQP involvement alone, which clubs must meet if they are to receive their funding from the RFU. If the UK leaves with no deal, all the players from EU countries, the Pacific Islands and South Africa – as well as Kenya, Zimbabwe and Namibia – who are not British-qualified, will then be classed as foreign players. 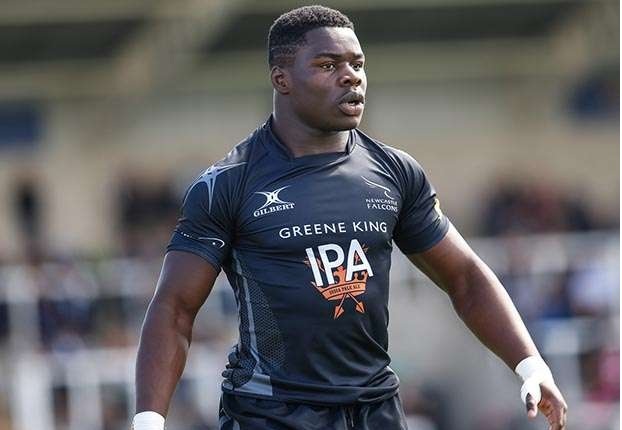 Kenya's Joshua Chisanga(pictured) played for Newcastle Falcons between 2016 and 2017 but left due to visa implications arising from Kenya's rank in the World Rugby. What should worry Premiership directors of rugby up and down the country, however, is how reliant they are on those Kolpak players, especially as their ability to select them regularly could be stripped as soon as March 29th. The Premiership currently only allows for two ‘foreign players’ in any matchday squad and whilst those spots are largely used by capped All Blacks and Wallabies as stands, the addition of Pacific Island and South African players to that definition will throw almost all sides’ selections into disarray. To use this weekend’s fixtures as an example, only Harlequins boast a side that, irrespective of the arrangements surrounding Brexit on March 29th, would be fielding a matchday 23 that would be legal by current rules. It’s a potential minefield of interpretations, but the outlook is not a positive one. The best-case scenario for those Premiership clubs would be for a deal to be agreed to on December 11th, which would at least give them the transition period to recruit and release players accordingly for subsequent seasons, or for the Premiership to dramatically alter its eligibility rules.